The average inground pool looks nothing like a natural body of water. Besides the shockingly blue chlorine water, it has a shape right out of a geometry textbook. 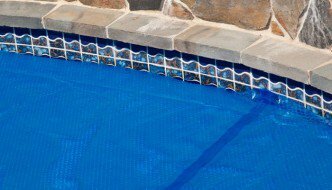 And of course, the area around a standard pool is often uniform tile or concrete decking. There’s nothing wrong with a pool like this – in fact, it’s what a lot of homeowners aspire to. However, an increasing number of people are turning to natural swimming pool designs for something that stands out as unique while blending into the environment. Rocks. Surrounding your pool with large rocks provides swimmers with a natural surface they can step on with bare feet. A diving rock offers an alternative to an artificial-looking diving board. Waterfalls. For a natural pool design, an inground pool waterfall is a must. It not only looks great, but sounds great, too. For truly natural pools, it also helps water circulation. Plants and Trees. Any inground pool can benefit from some creative landscaping and planting. However, a more natural pool design should go for a less manicured look. Fences and other signs of civilization can be blocked with bushes and trees, creating the illusion that you’re really out in nature – even if you’re not. Truly natural swimming pools are a fascinating topic in their own right. These idyllic swimming holes are manmade, but designed to support a healthy ecosystem of frogs, bugs, and various forms of aquatic plant life. In fact, the plants are essential for keeping the water free from algae. A natural pool typically costs about the same as a conventional pool to install. Of course, that’s if you can find a pool contractor who knows how to do it. Fortunately, if you’re up to the task, there are do-it-yourself guides on the internet that include a lot of the information you need. Natural pools are especially popular in Germany, but haven’t really caught on in the United States yet. That could change as more people learn how eco-friendly – and just plain cool – these swimming pools are.